We are a family focussed camp with activities for every age group, including the adults! There is plenty to do and plenty of choice! Elim Family Festival is a Christian camp, and we provide meetings for every age group each morning and evening. We have excellent worship and fantastic speakers, and we hope that everyone who joins us will connect with God in a deeper and special way as well as connecting with lots of people. It is based at Coulbeck Farm near Yarm at the edge of the picturesque Yorkshire Moors, on a large site with great facilities. 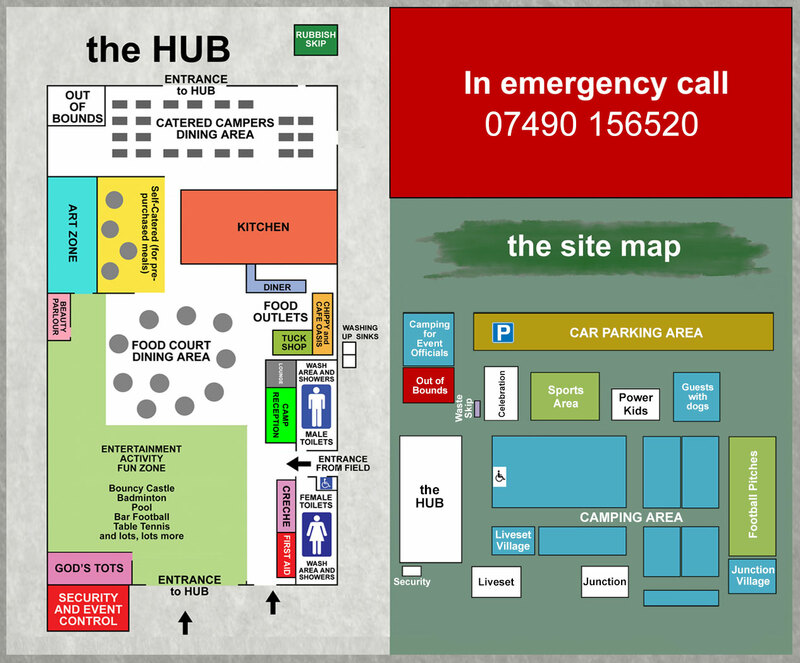 It features The Hub - a massive modern barn which is the main eating and meeting point, and also contains large shower and toilet blocks. With plenty of electric hook-ups for campers and caravans, there's no reason why you can't be comfortable whilst camping with us! From the North: Take the A19 South. 3 miles from destination, take a left turn into Trenholme Lane. Continue onto Belbrough Lane. Continue onto Enterpen. Turn right into Sexhow Lane - destination will be on your right. From the South: Take the A19 North towards Thirsk / Teeside. 7.2 miles from destination take a slight left onto A172. Turn left onto Sexhow Lane. Destination will be on your left. Once you've unloaded your vehicle please remove it to the car park. No vehicles are allowed in the Camping Area unless they are displaying a parking permit which allows those with special permission to have a car close at hand. The Cooking Area is out of bounds to everyone except the volunteers involved. We ask that guests do not miss meals without letting us know in advance. This sometimes occurs at lunchtime and can cause unnecessary waste. Please inform reception of any changes to your booked meals. If you are booking in as a catered worker or guest we cannot provide for any special dietary requirements other than vegetarians. If you have any queries on this please contact the Elim Festival office before booking in. All catered guests aged 12 and over will be asked to complete one session of washing up in the cookhouse to contribute to the running of the Festival. No alcohol or drugs on site and this includes returning to camp having consumed alcohol/drugs off site. Smoking is only permitted in the designated area. If you want to go off-site please ensure you have arranged adequate supervision for any of your party left behind, especially younger children. Please make sure you sign in and out at the security point if going off-site. We suggest 10pm if you're under 12 years old and 11pm if you are over 12 years old. There can be exceptions for special events. We have children of all ages on camp and we do ask that grown-ups keep noise levels to a minimum after bedtime. Curfew for everyone on site is 12.15am. Unfortunately, we've had our fair share of problems over the years with dogs on site! If you need to bring your dog, please keep it on a lead at all times and take full responsibility for it which also means please be responsible for clearing up after it has gone to the toilet! No dogs are allowed in The Hub unless they are guide dogs. We ask that boys and girls tents remain in separate tents/caravans and there is no visiting at night. For your own safety please do not play or climb on any structures or farm equipment. The stream is out of bounds as it is not safe and deeper than it looks in places. Do not wander off into the nearby fields where farm vehicles are at work. No one under 16 is allowed to leave the site without an adult. 16-17 year olds who's parents have given permission by signing the application form, are allowed to leave the site. Attendance at age specific meetings in an evening is mandatory for all under 18's. If under 18s are not attending their age specific meeting in a morning, they must be with their responsible adult. The late night 11pm - midnight gatherings at Junction is only for those aged 16 and over. No barbecues or open fires are allowed. 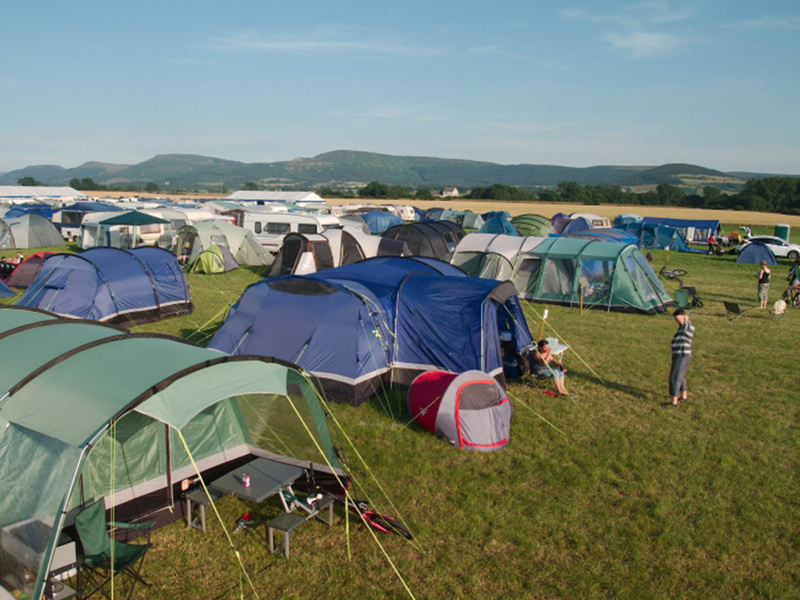 There MUST be a minimum of 3 metres between your tent/caravan and the nearest one and you MUST be a minimum of 6 metres from a marquee to prevent a fire spreading. Please help us by not arriving after dark as this contravenes our health and safety policy and we may not be able to allow you onto the camping fields with your vehicle. Fire lanes must be kept clear for health & safety (these are all the roads across site that are used for access). Please be considerate of others and don't play loud music/television or do things that disturb those around you. Thank you for your help in making the camp a safe and pleasant environment for everyone! Kit should include a sleeping bag, with an extra blanket (it can become quite cold at night), airbed, and a pillow. Clothes including nightwear, T- shirts, shorts, jeans, trainers for games, swimwear including a towel, jumpers and warm clothing for the cool evenings. Plastic crockery for meals (inc. large plate, bowl, knife, fork, spoon & mug). You will need your own tea-towel to dry your crockery. We do not supply these. It is essential to bring a waterproof jacket, coat and strong shoes for wet weather. A washing kit should also be brought, including towel, toothbrush, toothpaste, flannel, shampoo and soap. A torch is essential for the evenings. A Bible, notebook and a pen or pencil. If the weather is sunny then please make sure that you bring suncream with you (parents/supervising adult please make sure your children are provided with this as we cannot provide every child/youth with this) to protect against sunburn. This list is only intended as a guide and a reminder. Inclusion or exclusion of some items will be at your discretion.